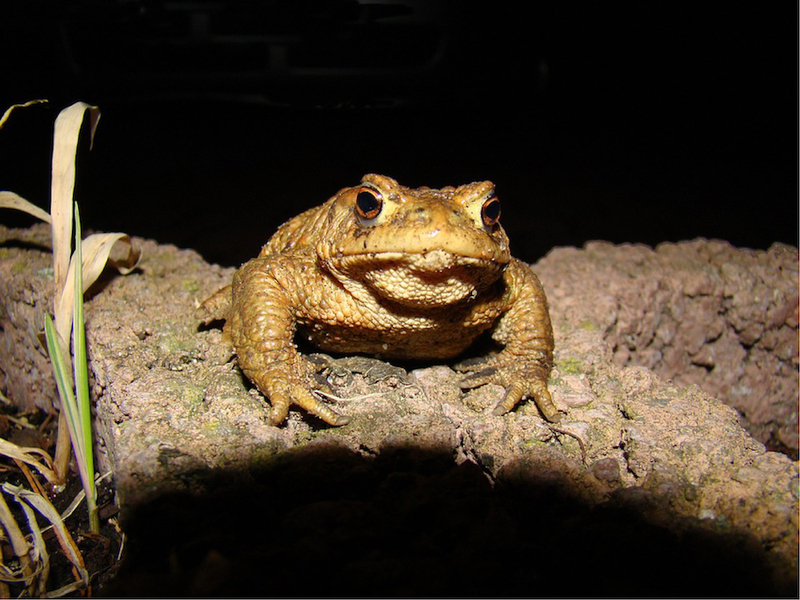 In a study at Case Western Reserve University, scientists tested for both direct and indirect effects of artificial light at night (ALAN) on American toads. The research was conducted over two life stages of the amphibians, studying toad larvae (known as tadpoles) in outdoor mesocosms (experimental ponds) and post-metamorphic toads in indoor terraria. It was published last month in the journal Proceedings of the Royal Society B. In the first experiment, the scientists found that when toad larvae were exposed to ALAN, their larval duration was reduced by one day. In natural environments, American toads transition from tadpole to juvenile toad in 50 to 65 days. When exposed to ALAN, their metamorphic duration was reduced by about 30%. Additionally, the experiment involving post-metamorphic toads found that juvenile toad growth was reduced by exposure to juvenile-stage ALAN. According to Kacey Dananay, lead author of the study, juvenile toads who metamorphosed from ponds with artificial light were 15% smaller in mass than toads in natural environments. Also, the scientists observed that juvenile toads in the control group were visible during the day but hid under leaves at night, while juvenile toads exposed to ALAN were equally visible in the day and night. While scientists are still trying to understand the complex relationships involved, the study notes, “Amphibians may be vulnerable to ALAN for three main reasons: (i) amphibians use natural light as a cue for behaviours across both larval and post-metamorphic life stages (e.g. activity); (ii) ALAN may indirectly affect amphibians by influencing other community members that have strong interactions with amphibians; and (iii) ALAN may have different effects in each stage, and these effects may carry over.” In other words, scientists believe there are many interwoven factors causing the recent decline of amphibian populations. However, this study of one species found “reduced juvenile toad growth in response to ALAN. This reduced growth may suggest toads exposed to ALAN may incur reduced fitness later in life, especially if additional stressors (e.g. predators, competitors, desiccation risk) are present and alter the effect of ALAN.” One study at a time, we are beginning to understand the full range of effects of ALAN on species, life stages, and communities. Dananay, K. L., & Benard, M. F. (2018). Artificial light at night decreases metamorphic duration and juvenile growth in a widespread amphibian. Proc. R. Soc. B, 285(1882), 20180367.